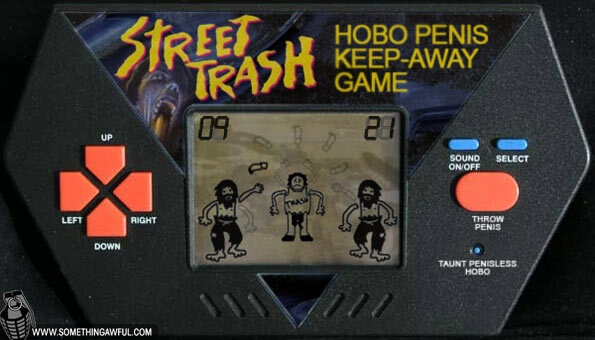 Roughly four years after the Something Awful Forum Goons first put imaginary movie-licensed LCD games in the sweaty palms of your virtual hands, a new crop of Photoshoppers has emerged to revive the awesomeness. Marshall Teller was gonna be a comedian. Instead, he showcased useless talent #35 by starting this theme. enigmahfc thinks hot dogs get a bad rap. They've got a cool shape, they've got protein. You like hot dogs, right? Capt. Rhodes wishes life came with a "taunt penisless hobo" button. Photoshop Phriday showcases the tremendous image manipulation talents of the Something Awful Forum Goons. Each week they tackle a new theme, parodying movies, video games, comics, history, and anything else you can think of. If you want in on the action, join us on the Something Awful Forums! Send musicians back in time!